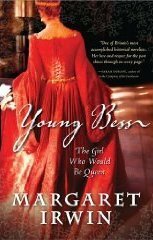 As I was reading my current read, Young Bess, by Margaret Irwin, I felt I came across a very important passage. So you must forgive me that it is not exactly two sentences long as the 'teaser' asks for. "You are telling me that all they care about is hard cash....But no laws can make good men. Men have never been so mad as now to make money at expense of their meighbour. But that is not a cause, it's a consequence. Debased coinage, debased goods, they're the result of debased ideas. All the old ways are gone. The world is in the melting-pot. We have the chance now to build a far greater and happier State than ever before. But they cannot take that chance; they cannot even see it. They are blind with greed. They are like wasps in a honey-jar, never seeing that their neighbour's deaths lead only to their own." Margaret Irwin published this novel in 1944, yet she was speaking of a period that was 500 years ago in England. How much of our present day political and economical situations mirror those that are quoted? Has anything changed? Will anything ever change? Why don't we ever learn? I believe that anyone running for any political office should be required to get straight A's in World History and American History classes for 4 years straight. This should be a pre-requisite before becoming a person that citizens are supposed to vote for. Perhaps learning from history, and applying that learning, we can cultivate ourselves for the greater good. Become that nation that stands as something to be proud of. Does being a policeman of the world give us that satisfaction? Does continuous war and grief bring us glory?